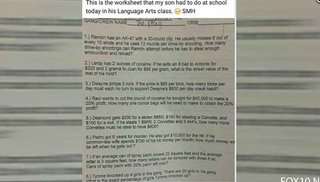 A parent posted this image of a racist math test reportedly given to eighth-grade students at her child’s Mobile, Ala., middle school. An Alabama middle school teacher has been placed on administrative leave for the remainder of the school year after reportedly passing out a test that included such questions as how many tricks would a prostitute have to “turn” to support her pimp’s crack addiction. According to Fox 10, the racist test, various versions of which have been seen since the 1990s, is a series of racially and culturally insensitive math questions. Teachers in Texas, New Mexico and California have all been disciplined for distributing the exam. Burns Middle School in Mobile, Ala., was alerted to the latest incident after the mother of an eighth-grade student went to the school Tuesday upset that the test had been given to children. The eighth-grader had snapped a photo of the test, given during a language arts class, with his cellphone camera and showed his mom. The boy’s mother said that she was shocked to see a series of word problems to solve that included equations involving drug dealing, the number of bullets in an AK-47 assault rifle, vandalism and prostitution. Rena Havner Philips, communications director for the Mobile County Public School System, confirmed that after an investigation by the school’s principal and resource officer, the teacher had been disciplined. The teacher’s name has not been released.